This is THE BEST chocolate cake recipe out there! Easy, one-bowl recipe, moist and melt-in-your-mouth, with tons of deep chocolate flavor! Chocolate cake! It’s everybody’s favorite, am I right? It is definitely mine. I’ve got a fabulous recipe for vanilla cake, a marble cake recipe that I love, and a red velvet cake that will knock your socks off. But in my book, chocolate cake always wins, hands-down! This is something I have been meaning to share for a long time. My chocolate cupcake recipe is one of the top posts on this site, and readers are always asking me if it can be done as a cake too. So here it is (finally! ): Simply Perfect Chocolate Cake. I posted the cupcake version of this chocolate cake years ago. I remember it took me like three or four tries (maybe even five!) before those cupcakes tasted the way I wanted. There was a laundry list of “musts” in my mind for that recipe. And I was not going to rest until I could check off each and every one. Well, my hard work paid off because that is one of the most popular recipes on my site to this day. There are tons of comments on it, from readers who tried and and LOVED it. Many of them say it’s the only chocolate cake they will ever make again! I’m super proud of it, and I’ve used it as a base as a lot of other recipes since. They all get the same kind of overwhelmingly positive response. But I figured it was time I just gave it the classic chocolate layer cake treatment. WHAT MAKES THIS THE BEST CHOCOLATE CAKE RECIPE? The batter is really easy to make and hard to mess up: It uses the reverse-creaming method, which I love because it means you only have to dirty up one bowl! 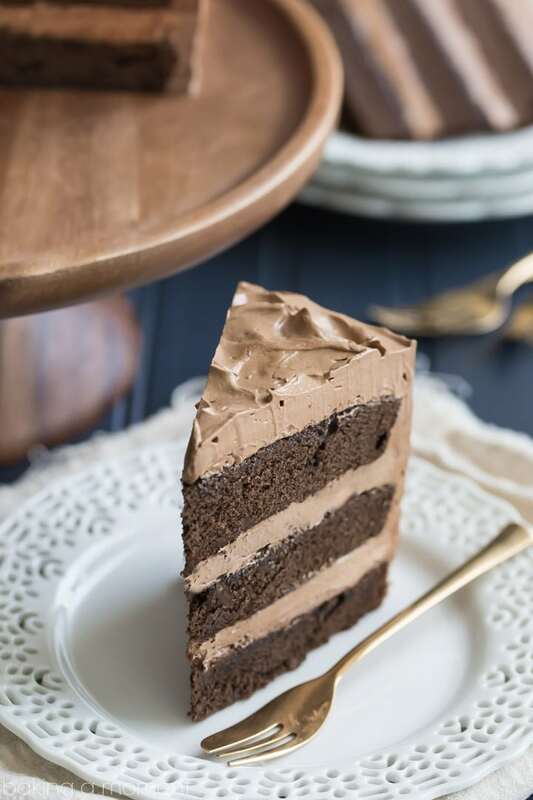 The batter is really thick and almost mousse-like: One of my pet peeves is a drippy chocolate cake batter that leaves a big mess all over your counter. This is thick and gorgeous, and you’ll have to stop yourself from eating it straight from the bowl! The texture is tender: it’s fluffy but not so soft that it can’t stand up to a generous layer of buttercream. It bakes up nice and moist: I’m including an extra step here to make it even more moist! It’s optional, but if you really like an extra-moist cake, you should definitely give it a try. The flavor is SUPER chocolate-y: I have another pet peeve and that is chocolate desserts that don’t taste all that chocolate-y. This chocolate cake recipe is made with cocoa, so it has the deepest, richest chocolate taste you can get. Any time you’re baking a dessert that wants to taste extra-chocolate-y, it’s cocoa you want! That’s where all the flavor is at, and you can read more about it on this chocolate cupcakes post and this brownies post. You’re going to love how easy it is to make chocolate cake from scratch! Start by combining your dry ingredients. Sugar, flour, cocoa, leavening and salt can all get whisked together. I like to use a combination of all-purpose and cake flour. You can learn more about why here: Why Use Cake Flour. Next, mix in the butter. After about a minute or so on low speed, you’ll see it start to look like damp sand. This is the time to add your eggs. Mix them in one at a time, stopping to scrape the bottom and sides of the bowl with a silicone spatula after each addition. Once the eggs are all mixed in, you can add your liquid ingredients. Feel free to use Greek yogurt or sour cream. Both work very well! Mix the dairy in, along with the vanilla, and beat the batter on medium speed for about a minute and a half, to aerate it and build the cake’s structure. Then just transfer the batter to your prepared cake pans, and bake! CAN THIS CHOCOLATE CAKE BE BAKED AS CUPCAKES OR IN DIFFERENT SIZED PANS? It certainly can! You can find the cupcake version here: Chocolate Cupcakes. As you can see in these pics, I baked my chocolate cake in three 8-inch pans. I just love the look of a tall cake! But if you’d prefer to bake it as two 8 or 9-inch layers, or even in a 9×13-inch rectangular pan, you can totally do that. Just keep an eye on the bake time because a thicker or bigger cake may need more time to bake than a smaller, thinner cake would. WHAT FROSTING SHOULD BE USED ON THIS CHOCOLATE CAKE? This cake is so versatile! It can be filled and topped in all sorts of ways. You can really let your imagination go wild! For the pics you see here, I’ve frosted and filled the cake with chocolate Swiss meringue buttercream. It’s my favorite by far! The texture is so incredibly silky, and the chocolate flavor is really rich and pronounced. I highly recommend it! CAN THIS CAKE BE MADE AHEAD? I actually really like the texture of this cake once it’s been wrapped in plastic and refrigerated overnight. Letting it chill like that seems to bring everything together really nicely, and the layers stay super-moist. A lot of times when the cake has been chilled, I don’t even need to bother with a crumb coat. It’s great! So yes I would recommend making this cake at least a day ahead, if you can! Once filled and frosted, it can stay out at room temperature for a day or so. After that, it’s a good idea to pop it into the fridge. The layers can also be tightly wrapped, slipped into a zip-top bag, and frozen. They will last in the freezer for about 6 to 8 weeks. Just thaw in the fridge and frost! Next time you have a special occasion to celebrate, give this chocolate cake recipe a try! I’m sure you won’t be disappointed, and you’ll get rave reviews from your guests! Generously mist three 8-inch diameter by 2-inch high cake pans with non-stick spray, and line with circles cut from parchment paper. Cut the butter into smaller pieces and add it to the dry ingredients. Mix on low speed until the mixture resembles damp sand (30 seconds to a minute). When all of the eggs are fully incorporated, add the Greek yogurt (or sour cream) and vanilla, and beat on medium speed for about 60 to 90 seconds, to aerate the batter and strengthen the cake's structure. Divide the batter evenly between the three prepared pans, and bake for 30-40 minutes, or until a toothpick inserted in the thickest part of the cake comes out clean or with one or two moist crumbs. Cool completely, then soak with cocoa simple syrup (optional), and fill and frost. Place the sugar and cocoa powder in a small pot and whisk to combine. Stir in the water and place over medium heat. Cook, stirring occasionally, until all the sugar has dissolved. Place one cake layer on a serving platter. Use a pastry brush to soak the cake with the simple syrup before topping with filling. Repeat as you add each layer. Click here for the frosting recipe you see in the pics: Chocolate Swiss Meringue Buttercream. can i have the measurement in grams plz… and in my region i dont have cake flour so what can i do for that.. plz rply thank u? Deepesh you can download my free printable weight conversion chart here: https://bakingamoment.com/weight-conversions-for-baking/. Thanks and good luck! Deepesh you can do 1 3/4 cup all purpose flour with 1/4 cup of cornstarch to create 2 cups of cake flour. I can’t wait to give this a try! What a gorgeous looking / sounding recipe! Thank you so much Gemma! I hope you enjoy it as much as I did! YUM! This cake looks super moist and rich in flavor. It looks simply perfect and I can see why your recipe is so popular. Thanks Amanda! I really do think it’s one of the best recipes on my site. So happy you like it! 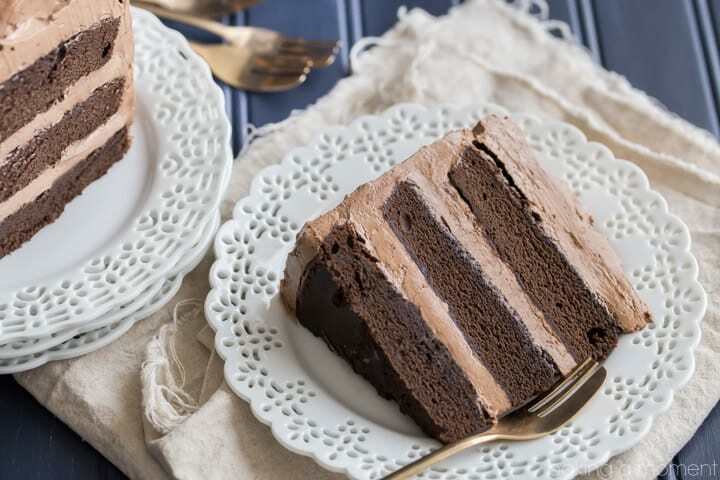 That chocolate Swiss meringue buttercream looks and sounds DELICIOUS! It is one of my favorite things in the world! Thank you so much Medha! Hi there, love your chocolate cake texture, is marvellous ! do you think I could reduce butter for the frosting ? That’s what I call perfection! Oh Allie. You just have a way…simply perfect is an apt title for this beauty of a cake. It’s dangerous for me to come to your blog because I want to head directly into the kitchen and get baking!! That is the sweetest compliment ever Marissa! Thank you so much! Indeed! Thanks so much Evelyn! I love your simple perfect recipes and this is no exception. This cake looks perfect indeed!! Thank you so much Zainab! I’m so glad you like this! You can absolutely skip that step! I make this cake all the time without the syrup and it’s still every bit as delish. The syrup just makes it extra-moist. Hope that helps! A great cake!!! Moist and yummy. Could I substitute the butter with vegetable oil? I’m so happy you liked it Holly! I haven’t tried making it with vegetable oil so I’m not real sure. If you end up trying it would you swing back and let me know how it comes out? Lol thank you so much! I take that as the highest of compliments! Could you please make this on Youtube? This cake looks delicious. I was wondering if these layers are as dense as they look, they do not look light and fluffy as say…… the Hershey’s recipes cake layers do. I like the texture of yours better. I am thinking of giving your recipe a try. Especially the Chocolate Swiss Meringue buttercream ! Also, do you think I could bake two 9″ layers and just slice them into 4 layers? Do these layers rise very much? Hey Sandra! Thanks so much for reading and for the great questions. I will answer as best I can! 1) Are the layers as dense as they look: I would say that this cake has a fine crumb. In other words, it’s not spongy or bouncy, with lots of big air pockets. It looks dense but it’s actually quite soft and has almost a melt-in-your-mouth quality. The Hershey’s recipe was always my go-to before I came up with this. I honestly never went back because I like the flavor and texture of this better and plus it’s not so liquid-y and drippy. 2) Do the layers rise much: As they bake, they probably double in thickness, or thereabouts. But I baked mine in 8-inch pans so I would think in a 9-inch you would probably have enough room, you just may have to adjust the bake times a little bit. Test for doneness by inserting a toothpick in the thickest part of the cake, if it comes out clean or with a few moist crumbs, you are all set! Hopefully that helps- good luck! I’d love it if you’d swing back and let me know your thoughts! If I wanted to make this into cupcakes, do you know about how many it would make? Hi Melanie! I referenced the cupcake recipe a few times in the post, but here it is again in case you missed it: https://bakingamoment.com/simply-perfect-chocolate-cupcakes/. Hope that helps! Sorry, I had missed that – thanks so much! No worries at all Melanie! This looks so delicious. Yum. Dear ma’am two things I am not a pastry chef so how do I get my icing job to look as good as yours also can I use my kitchen aid standing mixer? Hey Davey! You can absolutely use your stand mixer. That is what I use too. Any kind of mixer would work with this recipe. As for your icing question, I would recommend picking up either a large offset spatula (http://amzn.to/2cEAayU) or a dough scraper (http://amzn.to/2cAhRbS). <--affiliate links 🙂 These tools make a world of difference! Hope that helps; thanks for reading and I hope you enjoy! Question – How big of a difference does the cocoa simple syrup make? That’s awesome Lindsay! It definitely makes the cake a little bit more moist. But this was my first time adding the syrup (and I’ve made the cake dozens of times before) and I always thought it was great without too! Hope you both love, and happy birthday to your husband! Thanks so much for these recipes. I am making a cake for a reveal party, and she requested a chocolate cake. This recipe sounds perfect. I’m going to use homemade marshmallow fondant over it to decorate. I’ll try to send you a picture of it when it’s done and let you know how much everyone loves (because I’m sure they will)! Ooh I love that! So happy you’re going to try this recipe. I’ll look forward to seeing the pics! Thanks so much! Does it matter if I use natural or Dutch process cocoa? Hello… I have tried your cupcakes before (chocolate and vanilla) and if this recipe is as half as good.. I am a very satisfied reader/ follower/ fan/ taster. So Hirshey’s cocoa powder will do here? same as in the cupcake recipe? Natural cocoa is acidic , Dutch processed is alkalised . Raising agents are alkaline and balance that out. Dutch processed would need those adjusted to avoid soapy taste. Hi, i love the sound of this recipe, just wondering how long the icing can last? Hi Georgia! I would say at least a week in the fridge. It holds up really well! Good luck! I am in L-O-V-E. That frosting is totally the ICING ON THE CAKE OMG I JUST THOUGHT IT AND REALIZED IT THAT IS LITERALLY WHAT IT IS. Hahahahaha TOO FUNNY! Kayle you are just the best thank you so much for the sweet and funny comment! The came is in the oven and so far I’m in love! I plan on freezing them until tomorrow or can I just leave them on the counter covered? Also do you think I can substitute margarine for butter in the frosting? My son has a dairy allergy(fine when baked like the cake, not when raw) and can have a specific margarine. In afraid if the texture… any insight? Hey there! I’m so glad you like it so far! You can either freeze, refrigerate, or just wrap it up and leave it at room temp. My personal favorite is to refrigerate the layers; that seems to make it easier to frost. I’m afraid I haven’t tried subbing margarine for butter, so I’m really not sure about that. Sorry! If you give it a try I’d love to hear about the results! Please let us know how it all works out. Thanks so much for reading and trying this recipe! Oh I’m so happy to hear that Rosiemay! I’m thrilled that you liked it. Thanks so much for the awesome feedback! Hi! I’ve tried your chocolate swiss meringue frosting before.But for this recipes you added water and cocoa powder, so what is the different than the usual one you posted before? Hey Sue! I added cocoa powder and dissolved it in water for this one, just to get a deeper chocolate flavor. The old recipe would work just as well if you’re more comfortable with that. Hope that helps! Thanks for reading and for the great question! Thank you Allie. I will try the new recipe next time. I always bake this cake since u posted the simply chocolate cupcakes! I like it so much! Thank for sharing the recipes Allie! ? Just finished making this cake for my birthday cake… it is so moist and delicious!! I made it into 2 layers (because I only had 2 cake pans), and it turned out well. The frosting was a bit tricky, but totally worth the effort, so incredibly fluffy! Yum! Thank you for this recipe! This looks amazing! You say to use Greek yogurt or sour cream. Do you have a preference, and does using one over the other change it in any way or make it better? Thank you! Hey Donna! I usually use Greek yogurt but if I don’t happen to have it on hand I will sub with sour cream. They both work equally well! Both have that little bit of tang that’s needed to activate the leavener, but sour cream is a little richer. Totally up to your taste! Thanks for reading and for the great question; hopefully that helps! Hey Christine! I’m so glad you’re going to give this recipe a try! To answer your question: I have found that when the cakes first come out of the oven, they seem very fluffy. I like to wrap then tightly and refrigerate them overnight before frosting them. They seem to become more firm and dense as they chill, and for me that’s easier to frost. If you do it this way, I think you find the cake has the kind of structure you’ll need in order to support the fondant. Hope that helps! Good luck and enjoy! Hey Michele! I haven’t, but that’s just because I don’t have a mixer big enough to handle such a large batch, lol! If you do I would say go for it. I have no doubt it would work nicely. Good luck! Looks amazing! Quick question, if I want to make the cakes and refrigerate overnight before frosting, do I put the simple syrup on before refrigerating or the next day before icing? Thank you! Hey that’s a great question Ellen! I would probably do it just before frosting. Thanks so much for reading and I hope you enjoy! Hey i do not have any sour cream or yoghurt and i really wana make this cake right now! Can i skip adding them in altogether? No, I’m so sorry, but one or the other is necessary! What is the purpose of either the yogurt or the sour cream? Is there something else that can be used in its place? I am not a fan of the “tang”. Your cake looks delicious and the frosting looks silly and creamy so much so that I can practically taste it. Thanks Judith! That frosting is so good. As for the question about yogurt/sour cream, something with a little acid is needed in order to activate the leavening. I hope that’s helpful! The recipe looks amazing. I’ll be trying it soonest. Does this mean even buttermilk wont work for this recipe? Hey Ugoh! You can replace the Greek yogurt/sour cream in equal measure, you’ll just have a slightly runnier batter. It works fine though! And yes, that answers the question. Thank you. do you think this cake would go well with a homemade cream cheese & strawberry spread in place of the buttercream? It’s hard for me to say Siobhan, I’m not really experienced with cake carving. Perhaps make a quick half-batch and see if it has the kind of texture you’re looking for? Just FYI it’s usually more delicate when it’s fresh from the oven than it is after it’s chilled overnight. Good luck! This cakes looks beautiful and I am planning to make the cake itself for my family. I want to use this for a 10-in round so I was wondering what slight adjustments should I make? How many layers were you thinking Stephanie? I’ve never made swiss buttercream. Can I frost the cake and leave it out overnight in a cake box or does this frosting need to be refrigerated? I want to make it for a cake walk so of course it won’t be refrigerated. Thank you in advance. Hey Gina! I typically leave it out at room temp for a few days. It holds up just fine. I hope that helps! Good luck and have fun with the cake walk! I made this cake for my dad’s birthday and Wow! wow! Wow! This is only the 2nd cake that I’ve ever made as my mum is the baker of the family, plus I’ve never really liked the thought of putting in all that effort and time only to find when you cut it, it’s a dissapointment. I’ve always struggled with the science of it all but a 44 years old I decided to make my chocolate loving dad a cake. It went down a treat! Everyone loved it and I even impresssed my expert of baker mum. I spent quite some time converting cups to grams and learning how to substitute the cake flour. All in all it took me about 3 hours from start to finish but it was so worth it. It was quite something…llght, moist and creamy. The swiss buttercream simply divine! So much so that my son asked me to bake something just so we could use up the leftover buttercream (as I didn’t use all of the mixture on the cake). And believe it or not I felt confident enough after my achievements, that I made some chocolate cupcakes and topped them with the swiss buttercream. They did not dissapoint. If I can do it, anyone can. My mum has hinted to me since that she’d like to try a salted caramel cake. So if you have a recipe that I could try for my mum’s birthday this month II’ be very grateful. This is the best comment ever, Jo! I can’t tell you how happy it made me to read it. I’m so glad that you liked the cake and that your success gave you more confidence to keep baking. That just thrills me right down to my toes. Thank you SO much for making my day! And I have a great recipe for your mum! This is a huge family favorite- if mum doesn’t like nuts just leave them off. Same goes for the malt. https://bakingamoment.com/vanilla-malt-layer-cake-with-cashews-and-salted-caramel/. Also, if you need to convert measurements be sure to download my conversion chart here: https://bakingamoment.com/weight-conversions-for-baking/. Good luck and keep at it! The more you bake the easier and more intuitive it becomes, and it takes a lot less time too! Thanks so much Jo! Hi, Allie. Can I use chocolate ganache as frosting instead? Thanks. Hey Allie-Sunday dinner for the family today and I am going to make this cake as the peice de resistance. My first attempt at a Swiss buttercream!!! Wish me luck. Good luck Marcy! I hope you have fun and enjoy! You’re going to be the star of the show when you serve this! Hi Andrea! I’m afraid I’ve never tried it with vegetable oil, so I really can’t say for sure. If you end up giving it a try, I’d love to hear about the results! Hi! Can these cupcakes be made a week beforehand and frozen? I need these cupcakes at a busy time and would love to just take them out of the freezer the day before and let thaw in the fridge. Thoughts? I need to make a chocolate cake for the bottom layer of a wedding cake. I figured I could make it a week out, freeze it and then thaw on the Wednesday. Do you think I could fill the cake on Thursday with the buttercream and put in the fridge and then cover it with ganache on Friday and leave in out until the wedding on the Saturday? I think that should work just fine Deborah! Good luck! For how long does this chocolate cake bake..? “bake for 30-40 minutes, or until a toothpick inserted in the thickest part of the cake comes out clean or with one or two moist crumbs.” Good luck Elise! How do you think this cake would do in a 13×9 pan? I imagine it would do fine, it’s a cake batter. Hahah. But I guess what I’m really wondering is what would the time difference be? Would you be able to estimate that? I think it should work Miriam, although I haven’t tested it that way myself so I can’t speak to exact bake time. I would just keep a close eye on it and you’ll know it’s done when a toothpick inserted in the thickest part comes out clean or with a few moist crumbs. Good luck and let me know how you make out! I did end up going ahead and making this cake in a 13×9 glass cake pan last night in preparation for my mom’s birthday today. I’m pretty sure I opened the oven too many times, as my cake had fallen in the center and came out to be the thinnest part. 🙁 Not sure if that is the result of a fallen/thinner center, but I did a total of 3 checks/pokes/oven openings and it hurt my soul to have to check it that many times because we all know it’s best to not open the oven during the cook time. :/ First check was at 30 mins, not even close. Did 10 more mins (40 mins), still not very close but could tell the middle was getting slightly firmer. I did the final poke/crumb test at exactly 50 minutes and it had passed the doneness test on both the middle and edges, edges being the thickest part of the cake, so I advise to cook the cake for at LEAST 50 mins because at 40 mins, it was still a bit soupy-ish. But I’m also not sure if that would vary from place to place wherever you’re baking at. Something else to also note, I live in a higher altitude, Colorado. I’ve lived here all my life, and for all the baking I’ve done, I’ve never found or figured out a sure-fire way to add or subtract any ingredients for high altitude baking that doesn’t result in a drier cake, so I followed the recipe as is. The middle seemed more moist than the outer edges, but I didn’t cook any longer as it passed the crumb/poke test and I didn’t want to risk it burning. Even though the cake came out uneven, I did try to cut the sides down a bit to even it out. In doing so, I was able to sneak a taste and the flavor of the cake is incredible! Very well-balanced and it’s easy to see why this is such a popular recipe on the site! I also did add a slight drizzle of the chocolate simple syrup, mostly to the thicker outer edges to add moistness in case it lacked any in those areas. I also frosted with a basic chocolate buttercream because I didn’t have enough butter for the chocolate Swiss buttercream. :/ Still excited to try it all later. I’m sorry for this to be so long and drawn out, but in case someone else in the future has a similar question or I want to recall what I did, I hope I can help someone out with any tips I’ve provided or suggested and would love to hear what worked for anyone else if they took this route using a 13×9 baking pan/method and would love to hear about their end result and what worked for them/you! I do plan to make this cake again, with less oven checks/openings in hopes of a more even cooking. Haha. Thank you for this recipe, Allie! One of the best chocolate cake recipes I have ever come across! Can’t wait to see what my mom thinks of it when she tries it later! Thank you so much for the detailed update! I’m sure many readers will find your experience to be so useful. I’m so glad you were (mostly) happy with the recipe, and hopefully next time you’ll have an even better result! Would have made a fantastic trifle. Absolutely! It’s a great chocolate cake recipe and super versatile. Thanks Susan! Absolutely delicious cake!! And the frosting is SO good. We may have eaten the leftover frosting with a spoon 😉 Will definitely make this again. That’s so great to hear! Thanks so much for the positive feedback, Siobhan! Is the recipe amount the right amount for a 9×13 cake pan? If so how long would you bake it for? Thanks. Hey Michael! This same question has actually been asked several times in previous comments. 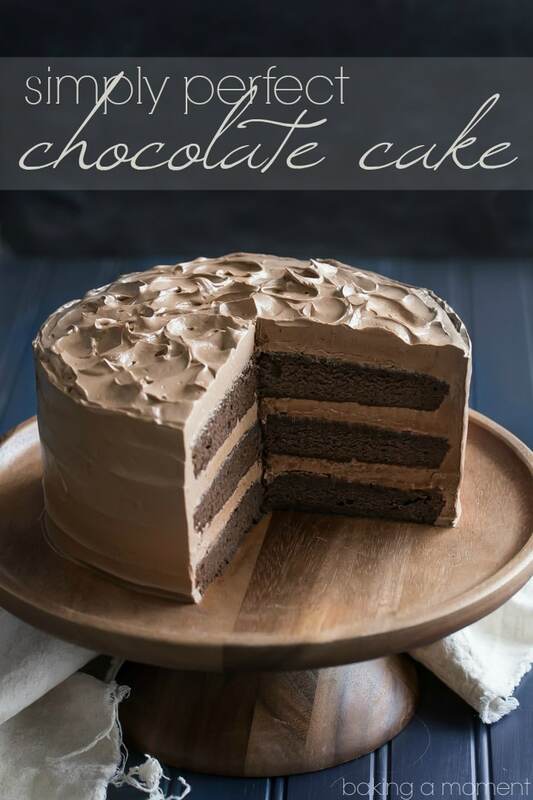 I’d refer you to Miriam’s comment (https://bakingamoment.com/simply-perfect-chocolate-cake/#comment-114455), where she gives detailed instructions on how to bake the cake in a 9×13. Hope that’s helpful! Hi Marko! I honestly don’t the the batter will. It really should go into the oven as soon as possible after the liquid and dry ingredients are combined. What is the diameter of your pan? And how deep is it? Hey Cori! This recipe actually makes a 3-layer cake, but you could make adjustments for sure. Just be sure to watch the bake time. You’ll know it’s done when a toothpick inserted in the thickest part of the cake comes out clean. Good luck, and happy birthday to your husband! Quick question: What is the rationale behind starting with the dry ingredients first then adding the butter then the eggs and finally the sour cream? Usually I would cream the butter and sugar then add the eggs and sour cream then add the dry ingredients. Thanks. Hey Michael! This is just another technique. It’s called the reverse creaming method, and it was popularized by Rose Levy Berenbaum. I just like it- to me it’s more foolproof and I like that it’s less cleanup. You can do it the traditional way too though- if that’s what you prefer. Thanks for reading! I’ve been searching the internet for a ‘best’ chocolate cake and at last I found one that has butter rather than oil in it – I hate oil cakes! I’m going to bake this for my daughter’s birthday. I only have two 8 inch tins … what do you suggest? I saw you said above that the cake batter wouldn’t wait. I really don’t want to have to buy another tin. I’m going to have to convert the recipe into grams/ounces as I only enjoy baking with weights – cup measurements are so vague – but even so dividing by a third is a bit cumbersome!Thank you! Hey there Mel! I’m so happy you are going to try making this cake! It’s truly one of my favorites. If you really don’t want to buy another cake pan, there is a trick that *might* work in this case: after you mist your pans with non-stick spray, wrap a long piece of parchment (about 24 inches long by 5 inches wide) around the sides of the pans before putting in the cake batter. This way, if the cake puffs up above the rim of the pan, hopefully the parchment would keep it from overflowing batter all over the bottom of your oven. I tried this one other time, and it worked, but it was a different cake recipe. Hopefully it would work just as well for this one though. Good luck and I hope that’s helpful! Hello, your cupcake version is my go to. Will be making this one but using two 6×2 pans. How long should I bake them for? I’m sure I will have leftover batter. Thanks!! Hey Annette! So happy you like the recipe! I’m not 100% sure you’ll be able to fit all this batter into just two 6×2 pans. The recipe calls for three 8×3’s. Perhaps if you halved the recipe? As for bake time I would give it a check after 20 or so… you’ll know it’s done when a toothpick inserted in the thickest part of a cake comes out clean or with a few moist crumbs. Hope that’s helpful! Sounds great Melanie! Definitely get that temperature down and I think you’ll be good. Enjoy! Has anyone ever used gluten free flour? Could you use coffee instead of water for the buttercream frosting? You absolutely could Meghan, and I think that would be delicious! I tried this and am very bummed. Made this a day ahead for husbands birthday. I ended with what looks like thick 1 inch cookies. Now day of birthday need a new recipe! Picture looks great but nothing like mine? Can I use plain yogurt instead of greek yogurt? I haven’t tried it Christine- but I do think it would work. Your batter just won’t be quite as thick because regular yogurt tends to me more watery. Hope that helps! Good luck and enjoy! I just made this cake and followed the instructions exactly, using Greek yogurt and adding the simple syrup step. I baked it for 30 minutes. The cake ended up very dry. What did I do wrong? Are there any other tips for keeping it moist? Thanks! Hmm I’m not sure Beth. You could try a bit less time in the oven? But saturating it with simple syrup should keep it from being dry. I made this cake on a whim about a month ago and it was simply incredible. I want to use it again and try to adapt it for cupcakes (for a friend’s bridal shower). I was wondering, have you tried adding things like champagne to the frosting? Do you think that would mess with the consistency? If so, I’ll scrap the idea because the frosting was easily the best part. Hey Alex! Thanks for the great question. I actually have more than one recipe on this site that incorporates champagne buttercream. I do think it’s necessary to reduce the champagne down quite a lot to concentrate the flavor, so you’re not adding too much liquid to the buttercream. You can check out the details here: https://bakingamoment.com/grapefruit-champagne-mimosa-cupcakes/. Hope that’s helpful! Aw, my pleasure Traci! I love that you topped it with white chocolate buttercream, that sounds so lovely! I don’t have spur cream or kosher salt… Is there anything I can do about that? This cake looks so good and I really want to make it! You can sub buttermilk or Greek yogurt for the sour cream. What kind of salt do you have? If it’s sea salt you can probably still use the same amount but if it’s table salt you’ll want to cut back. Good luck! The frosting was too runny. Now I’m going to have to make another cake. I wish I could post a picture of the cake. The frosting will be runny if the meringue is not cool enough. It really helps to refrigerate it for 5 or 10 minutes, then re-whip! I tried this recipe yesterday. I feel like the syrup made the cakes too soggy because they ended up falling apart while I was frosting it and it turned into a disaster. It was a tasty disaster, but my cake looked nothing like the pictures. The flavors were good, but it took such a long time for everything to come together and I was so disappointed when it did not work out. Maybe next time I’ll try it without the syrup and see if I have better results. I’m so sorry you had trouble Kay! It sounds like it was all the syrup’s fault. The good news is, that part of the recipe is completely optional. I do hope you’ll give it a second chance, and I’m glad to hear that at least it tasted good! This cake was perfect for what I was looking for. A delicate crumb, not as fall apart as a buttermilk cake but not as dense as a mud but still moist! The yogurt addition was great for the texture I will definitely be baking it again. The pleasure is all mine Lidia! I’m so happy it worked well for you and thank you so much for sharing your experience here. I love to hear a success story and I’m sure your story will be useful to other readers as well. Have a wonderful week! Hi Kerry! 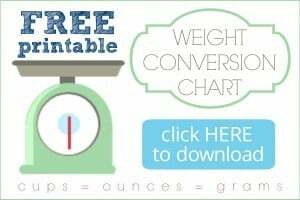 You should check out my free weight conversion chart- there’s a big graphic for it in the sidebar. Also cake flour is finer than plain flour and is milled from a harder wheat. It produces lighter, more tender cakes. There is a link to the exact product within the recipe card. Just definitely don’t use self-raising flour for a cake- it contains leavening and salt which is already listed in the recipe! Good luck and I hope you enjoy. Hi there, thank you for this recipe! Does it make enough batter for a 9×13? I would think so, although you’ll probably have to adjust the bake time. Good luck Michelle! I am trying to make a pirate ship cake, can this cake be sculpted or is it too crumbly? Straight from the oven it’s a bit crumbly, but I’ve found that if I wrap it in plastic wrap and refrigerate it overnight, it holds together much better. Good luck Lindsey! Hi Becky! Your birthday cake sounds amazing! I’m a huge fan of chocolate + fruit. To answer your question, yes, it should be. That is a pet peeve of mine too and so I always try to overcompensate. Good luck, happy birthday, and I hope you enjoy! My husband’s birthday is this Monday, Sept 4th. I am going to give your recipe a try. He is a complete chocolate freak. However, he doesn’t like yogurt or sour cream. Which one works better and can you taste either one of them? I have 9″ pans, will they work ok? What does the syrup do? It doesn’t make it too runny does it? 1) You can use either Greek yogurt or sour cream. They both work well but I think the sour cream tends to produce a slightly richer quality. You really won’t taste them at all, they’re just there to add moistness and to help activate the leavening. 2) If you use 9-inch pans rather than 8-inch, the layers will come out thinner and they will bake faster. You may want to try baking it as a 2-layer cake instead of 3, just to offset this. 3) The syrup is just to add more moisture to the cake. It’s completely optional! It does not make it runny, just a bit more moist (almost like tiramisu). If you choose to skip that step, I have found that just wrapping the cakes tightly with plastic wrap and refrigerating them overnight, before frosting the cake, does a lot towards making the cake more moist and easier to frost/less crumbly as well. I hope that’s helpful! Good luck and let me know if you have any other questions. And happy birthday to your hubby! Thank you for everything, your a doll. Btw, Wyatt can i do if i don’t have cake flour? I would hate to buy a full bag when it requires so little. Will it mess up the cake/quality of it? I do recommend cake flour because I think it lightens the texture of the cake. I use it in pretty much all of my cake recipes, so for me it makes sense to keep it on hand. That said, I do believe I have seen some recipes online for cake flour substitutes. I want to say it’s made with a combination of all-purpose flour and cornstarch- I’m sure if you google you should be able to find some recommendations. Good luck Natalie! WOW!!! That’s all I kept saying after every bite! I made this for my husband birthday yesterday and her really loved it. This is for sure the best chocolate cake EVER!!! AND MY GO TO FROM NOW ON! Thank you for all your hard work in creating this beauty! Your the best!!! So happy you liked it Natalie! Thanks so much for the great feedback and happy birthday to your husband! Glad to hear it, Nicola! You just want to be sure that it’s no longer hot to the touch, so that it doesn’t curdle the eggs or melt the butter. Hope that’s helpful! Tried recipe by directions.Was not satisfied with the texture of the cake. Too similar to baked cornbread. The taste was good.Never have been a fan of one bowl mixing method. The icing I fell in love with at first bite. Will make the icing again. Made this as a birthday cake for son-in-law, he was satisfied to take the whole thing home. I’m so happy to hear that James! Thank you so much for trying one of my very favorite recipes, and for taking the time to leave your feedback! Very much appreciated. It would probably work ok as long as it’s doweled. Good luck Lynnette! OMG! This chocolate cake is the bomb! Its absolutely fabulous. I used Callebaut bittersweet chocolate chips and cold coffee instead of water in the buttercream. Perfect! I am very ambivalent when it comes to chocolate cake but this one caught me by surprise…absolutely delish! So happy you liked it Kim! Thanks for the great feedback! I made this cake day before yesterday… the cake taste AMAZING!! So chocolatey. The texture of this cake is great, it really is in a category of its own. This is a great recipe. My family really enjoyed it. On the other hand, my icing fell short. Everything was going well until I started adding the butter and really started to deflate when the chocolate was added. The icing turned out so thin. I don’t know where I went wrong. This was my first time making icing. I let it cool, then mixed it more, but that didn’t seem to work. How do I get the icing thick & whippy-like ? Also, how can I incorporate this cake to make it like a chocolate cake & cheese cake? I think that would be delicious as well. What do you suggest? Really great cake and very simple to made. thanks for sharing. I want to cool the cakes and frost it all in the morning. Can I make the frosting tonight and will it keep in the fridge? Or should I just make it right before I want to frost the cake. You can make it beforehand but it will probably need to be re-whipped to fluff it back up after it’s been sitting. Good luck! Hi Allie, your cake looks amazing, but I wonder is it the same recipe with the chocolate cake with raspberry cream? because the texture in the photo looks different. I like this one here, it looks dense and less crumbs. Hi Jane! It’s the same cake recipe, but it’s brushed with a simple syrup to make it even more moist. Good eye! I made just the cake recipe today as a test cake for my son’s 1st Birthday. The recipe was so simple to follow and make. I really liked not having to cream the butter and sugar first. 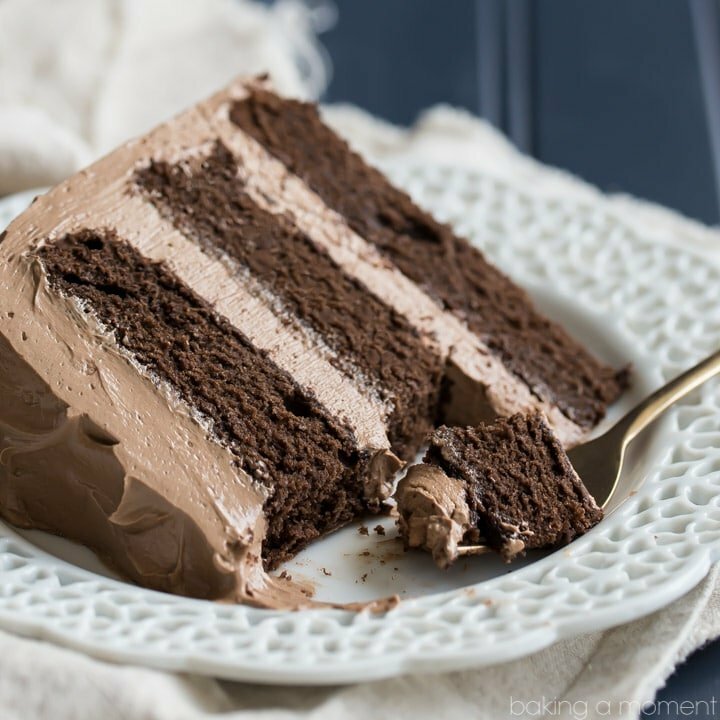 The cake is so delicious, moist, perfect texture and just the right amount of chocolate taste! Everyone in my house loved it. Thank you for sharing this recipe, it will be the chocolate cake recipe I will use from now on. I can’t wait to try out the icing recipe next! I’m so happy you liked it Debbie! Thanks so much for the terrific feedback, and happy belated birthday to your little one! I made this in 2 – 9 inch cake pans and it turned out great, checked it at 30 mins then baked another 7 as per the tip of another commenter. My main thing to share is that you should NOT attempt the buttercream with a hand mixer. It would not come together no matter how long I whipped it. I had to call in an emergency Kitchenaid and was going to give up and try again with new ingredients but decided to try and at least attempt to salvage what I had by whipping it in the kitchenaid and it miraculously came together and was perfect. Will definitely make again! That is so good to know Kim! I use my KitchenAid almost exclusively, but I know a lot of other readers have had trouble with the buttercream. Perhaps this is the reason. Thanks so much for the feedback! Great! I hope you enjoy! Sure thing Regina! This recipe was based off of my Simply Perfect Chocolate Cupcakes, which also inspired this Chocolate Peppermint Bundt Cake. I think if you just leave out the peppermint extract, you’ll have just what you’re looking for. Good luck and enjoy! Do you have a trick for mixing with cocoa so that it doesn’t go all over the place? I have tried the KitchenAid shield and have wrapped a towel around the mixer. Keeps on from going up onto the cabinets, but still makes a mess on counter and mixer and I hate losing all that mix. Hey Toni! Well, you definitely want to start it on the lowest speed, but I know that even that sometimes is too fast to keep all the ingredients in the bowl. What I’ll often do is to kind of “pulse” the machine on and off a few times, just until things start to incorporate a bit. Hope that’s helpful! The cake is good but I think th best part is the icing which is absolutely amazing!! It is completely heavenly. So happy you love it too! Thanks for the great feedback. This is one terrific recipe and destined to be our “go to” chocolate cake! I am a big fan of classic cakes like this! super simple to make and absolutely delicious! Wow! This was incredible!! I ran out of time to do the icing so made a quick mascarpone and butterscotch chocolate one which worked fine. But the sponge…OMG…it’s my favourite cake I’ve ever made. Thank you!! So happy you liked it Cat! Thanks so much for the great feedback! Is the cocoa powder in this recipe Dutch processed or regular cocoa powder? Wow….this cake looks sooooooo delicious! And as you describe it… my mouth is watering already! And i haven’t baked it yet! But i notice you don’t use chocolate at all, only Cocoa powder. Is that for the chocolate flavor better to leave the real chocolate out? I’ve baked several chocolate cakes wich had also a load of Cocoa powder in it, but also melted chocolate and i miss that in your recipe. I guess it is on purpose so it intriges me. That’s why i’ll give your cake a try real soon! My inner clock tells me that it’s time for chocolatecake. And of course i’ve to listen to my inner clock! Thanks for the recipe, i’ll give it a try. Till next time. Hey Marja! I’m so happy you like this recipe. I linked to a couple of other articles within the post, that speak to your question about why this recipe has only cocoa powder and no melted chocolate. Those links can be found in the last bullet point under the heading “What makes this the best chocolate cake recipe.” Hope you enjoy reading up on that! I KEEP waiting for the recipes to show so I can email to keep I get all “the abouts” but the Recipes (quantity& ingredients) are NOT Showing at all, WHY? I’m trying to get your SIMPLE VANILLA CAKE & SIMPLE CHOC CAKE, & PUMPKIN BREAD. Not having this problem on any other site from my android. Thanks for letting me know about this issue. I’m not seeing the problem on my devices, but I’m glad you mentioned that you are on an android- that’s very helpful to know. I have my support person looking into it now. I will let you know as soon as it is resolved! Really simple and Really delicious. admiring ..
What a hot thing. I’ll try your recipe today !!!! It did not seem to be difficult to make this recipe. I liked the photo of the final result of the cake. I’ll try!!!! Thanks for the great feedback! Hope you love it! Thank you so much for this recipe. I made the Swiss buttercream as well. This cake is amazing. I saved this on my recipe drawer. So happy you liked it Tamara! Thanks so much for the positive feedback! This is wonderful! You have done an excellent job explaining the reasons to do the little things I’ve always wondered why. Thank you! My pleasure Jacklyn! So happy you enjoyed! You’re so welcome Tammy! My husband is also diabetic so I know how important it is. So happy you liked this cake and I hope you like the vanilla one even more! I just started baking from scratch and I Love it! I use to bake a lot from boxes. I’ve baked 2 cakes from other online recipes and yesterday i decided to bake this AMAZING Chocolate Cake! My Husband and Sons LOVED IT!! I haven’t tried it yet cause i baked it late last night but only about 1/4 of the cake was left this morning lol. I will be baking your Vanilla Cake tonight. Thank you so very much!! So glad to know that your hubby liked it so much! Hope you enjoy the vanilla cake too! Heya the top of your blog I see you state to use leveling, but it’s not on the ingredients list. Should it be included or not? Do you meant to say “leavening?” If so it is listed in the recipe ingredients. This cake is leavened with baking powder and baking soda. Hi Silvia! Thank you so much for the sweet compliments. I do not have a book- all my recipes are free online. God bless you too! Hi I would like to have a white frosting outside and chocolate frosting inside the cake. What would you suggest? Hi Yvonne! I have a chocolate frosting and a vanilla frosting on this site. Just type “American buttercream” into the search window at the top of the site; they should both come up. Good luck! Hi Allie, I tried your swiss meringue buttercream and find the taste buttery. Is this normal? I also tried your whip cream frosting with cream cheese and would prefer this. But for frosting a birthday cake, which is more stable? Hi Yvonne! Yes Swiss meringue buttercream is very buttery tasting, that’s totally normal! And I would say that it is definitely more stable than the whipped cream frosting. Sorry- I’m sure that’s probably not what you wanted to hear! Hi i made this cake twice and both of times layers came out not that tall. Is that normal? I have to stack up the 4 x 8″ to get a tall cake. Taste wise is great. Put in fridge and let in cool for a while before eating makes the cake more moist than 1st day bake. Totally agree with your tip about chilling first! And yes the layers should bake up around 1-inch tall, so this is a great recipe for layering. Thanks Yvonne!